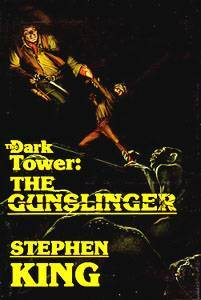 The Gunslinger is the first volume in the Dark Tower series, which Stephen King considers to be his magnum opus. The story centers upon Roland Deschain, The Last Gunslinger, in a world where time has moved on. He pursues The Man in Black, across a desert on a journey into good and evil. On the way he encounters an alluring woman named Alice, and begins a friendship with the Kid from Earth called Jake. Roland's (also know as Roland of Gilead) ultimate goal is to reach the the Dark Tower, the nexus of all universes. This mysterious tower's power is failing, threatening to destroy everything in existence. It took King twelve years to complete the novel. The finished product was first published by Donald M. Grant, Publisher, Inc. as a limited edition in 1982. In 1988, Plume released it in trade paperback form. Since then, the book has been re-issued in various formats and included in boxed sets with other volumes of the series. 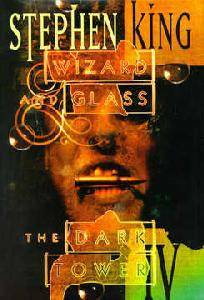 In 2003 the novel was reissued in a revised and expanded version with modified language and added scenes intended to resolve inconsistencies with the later books in the series. 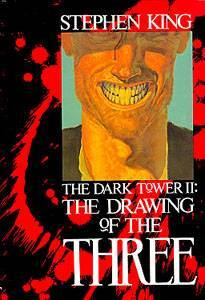 The Drawing of the Three is the second in the Dark Tower series. Originaly published in 1987 by Donald M. Grant. The story of The Gunslinger continues and follows Roland of Gilead and his quest for the Dark Tower. The Man in Black is now dead, and Roland is about to be hurled into 20th-century America, occupying the mind of a man running cocaine on the New York/Bermuda shuttle. He encounters three mysterious doorways on the beach and each one enters into a different person living in New York. Through these doorways, Roland draws the companions who will assist him on his quest to save the Dark Tower. 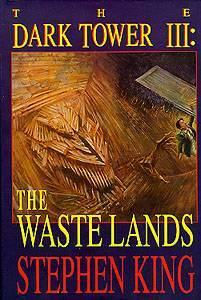 The Waste Lands is the third book of the Dark Tower series. Published in 1991 by Donald M. Grant this was originally released as a Limited Edition Hardcover featuring full-color illustrations by Ned Dameron. With two new members to his ka-tet, Jake Chambers and a billy-bumbler named Oy. Roland Deschain and his companions find the Path of the Beam and move ever closer to the Dark Tower. Soon they enter the decaying city of Lud where they encounter new dangers including Blain, a sentient train that has gone insane. 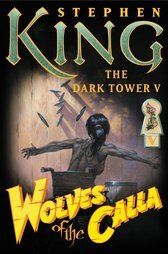 A Reissue of the book was released in 2003 to coincide with the publication of The Dark Tower V: Wolves of the Calla. In this novel Roland and his followers have to contend with a sentient monorail intent on killing itself and taking them with it. After fruitlessly hours of riddling Blaine the Mono, Eddie defeats the mad computer with one of his signature talents, telling childrens jokes and riddles. Blaine ultimately is unable to handle the "illogical" riddle and short circuits. It is here that Stephen King takes the time to expand on Roland Deschain's character, telling a little more about his past. While seeking to return to the Path of the Beam that will lead them all to the Dark Tower, Roland tells his friends a long-ago tale of love and adventure of a beautiful and quixotic woman, Susan Delgado and the tragic loss of this first love. After escaping the perilous wreckage of Blaine the Mono and eluding the evil clutches of the sorcerer Randall Flagg, Roland's ka-tet continue on their southeasterly journey, along the path of the beam. In the borderlands that lie between Mid-World and End-World they travel to the farming village of Calla Bryn Sturgis. It is here they meet Father Callahan (originally introduced in King's 'Salem's Lot') who request the ka-tet's assistance. The town will be attacked by the masked Wolves, riders that gallop out of Thunderclap once a generation to steal the town's children. The Calla townsfolk need the kind of help only gunslingers can give, if the tet agrees to help then Father Callahan promises to give them Black Thirteen, the most potent and treacherous of Maerlyn's magic balls. Meanwhile, in the New York of 1977, the Sombra Corporation plots to destroy the lot at Second Avenue and Forty-Sixth Street. How can Roland and his friends both save the rose and fight the Wolves? They achieve this by using the magic of Black Thirteen (the eye of the Crimson King himself). Time is running out on all levels of the Tower and unless the ka-tet can defeat the minions of Thunderclap both in our world and in Mid-World, they will never reach The Dark Tower. 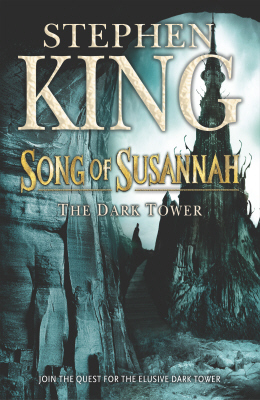 Song of Susannah is the sixth novel in Stephen King's The Dark Tower series. Illustrations by Darrel Anderson, published in 2003 by Donald M. Grant. The penultimate novel in Stephen King's seven-volume magnum opus, Song of Susannah take takes place in our world (New York City and Maine). To save the Tower they must rescue Susannah while also securing the vacant lot Calvin Tower owns before he loses it to the Sombra Corporation. Enlisting the help of the Manni, the remaining katet climbs to the Doorway Cave to open the magic door to our world. Here the ka-tet split up into different where and when's. The demon-mother Mia has entered the the body of Susannah Dean to enable her to give birth to her "chap" and uses the power of Black Thirteen to escape to New York City in the summer of 1999. It falls to the boy Jake with Oy, his billy-bumbler, and the fallen priest to find Susannah-Mia. Eddie and Roland, find themselve in western Maine in the summer of 1977, a world that should be idyllic but isn't. Here they find the author of a novel called Salem's Lot, a writer who turns out to be as shocked by them as they are by him. The Dark Tower is the seventh and final book of Stephen King's Dark Tower series, published on September 21, 2004 (King's birthday) by Donald M. Grant Publishers, and illustrated by Michael Whelan. Roland's ka-tet remains intact, though scattered. Susannah-Mia has been carried from the Dixie Pig (in the summer of 1999) with Jake Chambers, Oy and Father Callahan on chase to battle the evil infestations within, a vampire lounge featuring roasted human flesh and doors to other worlds. Susannah-Mia has been taken to a birthing room in Thunderclap's Fedic. Mia, her body now physically separated from Susannah Dean, gives birth to Mordred Deschain, the biological son of Roland Deschain and Susannah with The Crimson King a "co-father". The child Mordred shapeshifts into a spider-creature and feasts on his birth-mother. Susannah wounds but fails to kill Mordred although she manages to escape and meet again with Jake. Roland does eventually make it to the tower, though King leaves us with one if his usual twists. DarkTowerBooks.com is currently being redesigned with a clean, Web 2.0 design. The new site will feature well organised sections containing information on the Dark Tower series itself, along with other related material - comics, companion books, the up-coming movies, and other products that have or will be released.